These golden young potatoes are boiled to doneness then smothered in a buttery bacon sauté. The results are tender and super delicious. Not only can this recipe be served right away but it can be kept warm for hours after prepping. 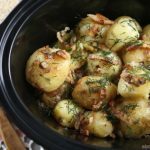 Say if you were going to a church service and you needed to serve lunch, after prepping the potatoes (boiling the potatoes to doneness and smothering in a sauté mix) you can toss everything into a slow cooker; set to a low setting and let the potatoes stay warm until needed. This also helps the potatoes soften up more. The cured pork that is used in this recipe is very similar to Ukrainian bacon (calo) but regular bacon can also be used as well with tasty results. So do give this easy and tasty potato dish a try. Peel and wash Yukon Gold potatoes. Place into a large pot, cover with water and bring to a boil. Boil for 20-25 minutes or until fork tender. Tip: If serving right away increase boiling time anywhere from 25-30 min. 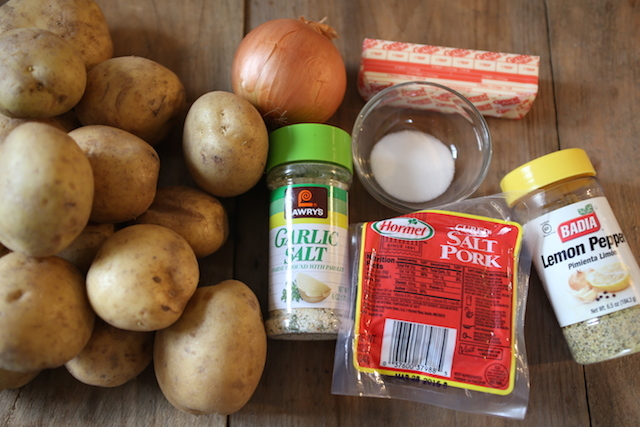 Once potatoes are tender; drain and add the butter, seasonings, and the pork sauté mixture. 4. Toss everything together to coat. 5. If serving right away garnish with dill and serve with sour cream. Or throw everything into a slow cooker and set slow cooker to low settings until needed, then garnish and serve. Peel and wash Yukon Gold potatoes. Place into a large pot, cover with water and bring to a boil. Boil for 20-25 minutes or until fork tender. Tip: If serving right away increase the boiling time anywhere from 25-30 min. 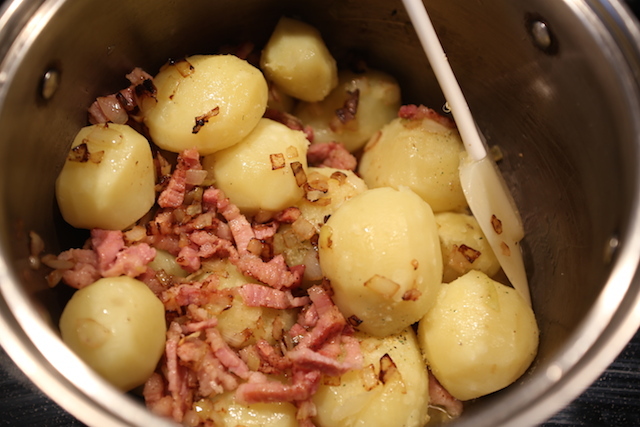 Once potatoes are tender; drain and add the butter, seasonings, and the pork sauté mixture. Toss everything together to coat. If serving right away garnish with dill and serve with sour cream. Or throw everything into a slow cooker and set slow cooker to low settings until needed, then garnish and serve. Looks delicious! Have a question? Where did you bought package of cured salt pork? Thank you Viktoriya! I purchased the cured pork at Price Rite in the pork section of the meat aisle. If you can’t find cured pork you can certainly use bacon. However, I happen to really like how chewy and meaty the pork comes out to be, where as if you were to use bacon, it can get soggy and stringy at times, especially if it’s not crisp enough before adding to the potatoes.